Business hour: 7.00am till 11.00pm every day. THE newly opened Royale Bintang Damansara Hotel has pulled out all the stops in coming up with its Ramadan buffet. Chef Khairudin with the help of his 18-member team has conceptualised Warisan Nusantara that features 80 types of traditional Malay dishes. At the media preview, we were introduced to some of the dishes that will be the highlights at the buffet table. First on the list was Siput Sedut Sulur Keladi and Rendang Tok. These two dishes won hands down with its fine combination of ingredients, creating balanced flavours. Apart from the main course, guests can also try something from the appetiser section like lemang, chicken and tom yam soup, serunding and kerabu mango. Another dish that got full marks from us was the Ekor Sapi Lada Hitam, that had the right mixture of spices. Even though black pepper was the main spice, it did not overwhelm the palate. After trying the tasty dishes at the appetiser and main course sections, end your meal with fine choice of desserts that range from assorted biscuits, bubur mempelam, chocolate cup cakes, pudding, cakes and pastries. With different types of traditional dishes, those craving authentic Malay dishes will surely find this buffet line up satisfactory. 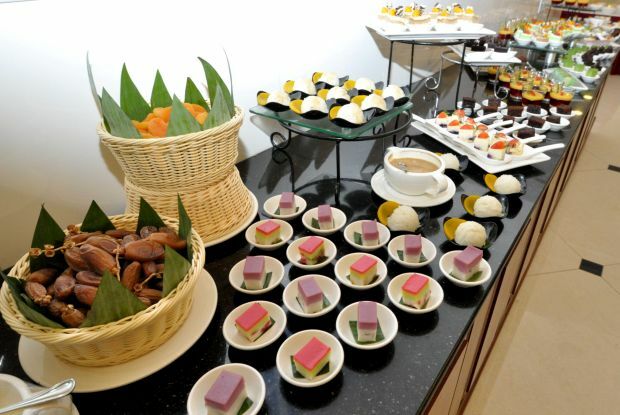 The Warisan Nusantara buffet promotion is priced at RM88++. The promotion is valid until Aug 18.